The "High West Rhodope - Batak, Devin, Dospat" interactive map was developed as a part of the project "Mapping and promotion of fishing area "High West Rhodope - Batak, Devin, Dospat" as a complete tourist destination with a focus on fishing tourism". The project is implemented with the financial support of Operational Programme for the development of the fisheries sector at FLAG "High West Rhodope - Batak, Devin, Dospat". 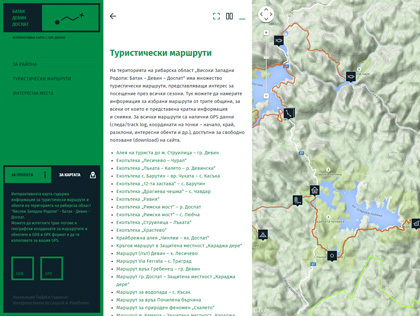 The "High West Rhodope" interactive map contains GPS data and information about the tourist routes and interesting places in the area. 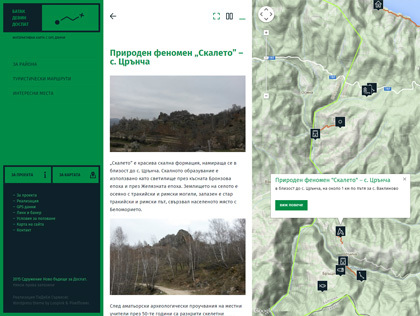 Users can download GPS tracks for all the routes and places located in Batak, Devin and Dospat municipalities in Bulgaria.